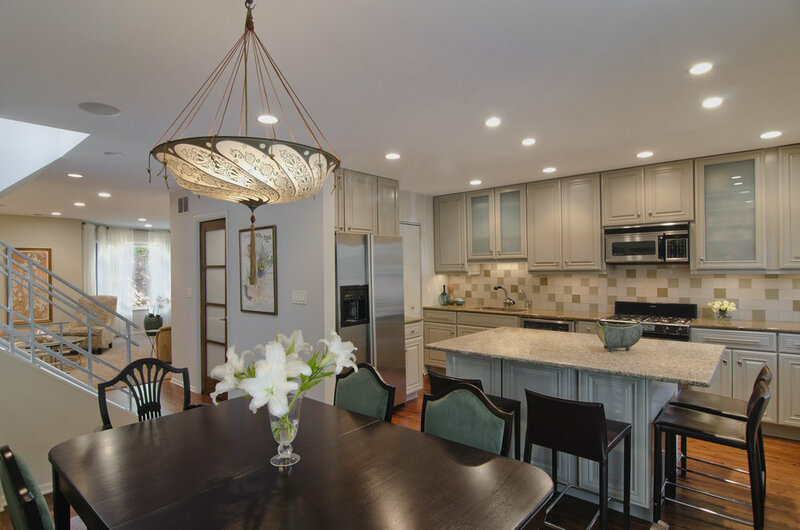 This client wanted to update her kitchen to be aesthetically cohesive with the rest of her home without the expense of purchasing new cabinetry. We decided to have the cabinets painted in a custom color lacquer that reflected the palette of the existing glass tile backsplash and glass doors in the dining area. We also inserted opaque glass panels into three upper cabinet doors. The existing countertop and hardware was reused. The result is a sleek sophisticated look that integrates the kitchen and dining areas, at a fraction of the cost of a new kitchen. Recycled and updated!